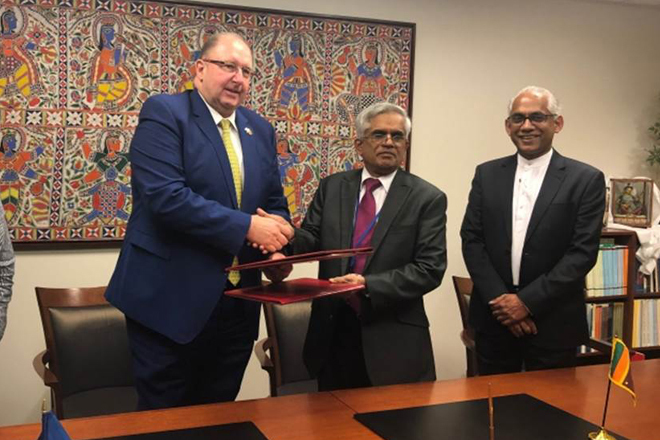 Apr 12, 2019 (LBO) – Sri Lanka and the World Bank has signed two new agreements worth 150 million US dollars to improve climate resilience and agriculture productivity for small farmers and support priority infrastructure through public-private partnerships. The signing took place during the World Bank Group and IMF Spring Meetings 2019 in Washington, in the presence of State Minister of Finance, Eran Wickremaratne. “Sri Lanka is on a path to becoming an upper middle-income country,” said Hartwig Schafer. · A $125 million credit for the Climate Smart Irrigated Agriculture Project, which will improve the resilience and productivity of agriculture for more than 470,000 small farmers in 6 provinces in the dry zone of the country. · A $25 million loan for the Framework Development and Infrastructure Financing to Support Public-Private Partnerships Project, which will help the Government of Sri Lanka develop a platform to attract and sustain investments required to fulfill its future development priorities. The Climate Smart Irrigated Agriculture Project will be implemented by the Ministry of Agriculture, Rural Economic Affairs, Livestock Development, Irrigation, and Fisheries & Aquatic Resources along with the six Provincial Councils participating in the project. The total project cost is $140 million, including a $125 million credit from the International Development Association, with a $10 million contribution from the Government of Sri Lanka and a $5 million contribution from the project beneficiaries. The key principle of the Framework Development and Infrastructure Financing to Support Public-Private Partnerships Project is to encourage the private sector to invest in priority projects selected through competitive procurement processes to ensure value for money. The project will be implemented by the Ministry of Finance and Mass Media together with the National Agency for Public-Private Partnership. The $25 million loan has a 20-year maturity, including a 9-year grace period, and $2 million counterpart funding.